The solution provides a custom time slider that allows users to view the data at any time. CEOCDSS's base layer is published by an Esri map service. The toolbar contains the table of contents, a map bookmark list, GIS tools, and a map position tool. In August 2009, Typhoon Morakot hit Taiwan and resulted in record-breaking accumulated rainfall within a short period of time (one rain gauge recorded a total rainfall of 2,965 millimeters in three days). Hundreds of casualties and severe debris flows were caused by Morakot. Time-aware functionality allows users to easily browse different time versions of an event. To provide integrated and comprehensive-solutions from all government resources, the National Science and Technology Center for Disaster Reduction (NCDR) assigned a disaster intelligence group providing various types of typhoon disaster assistance, including a Central Emergency Operation Center Decision Support System (CEO-CDSS). This system integrates other government agencies' typhoon information, such as disaster news and predictions, emergency response, and rescue organizations. CEOCDSS employs the interface design concept of full map content and user-friendliness. Disaster response commanders and other CEOCDSS users can navigate the system easily even without being familiar with GIS. The user interface is divided into three main sections: map setting, basic toolbar, and advanced toolbar. The map setting region includes a basemap switch and map scale slider, with which users can select streets, terrain, and aerial and satellite image maps. 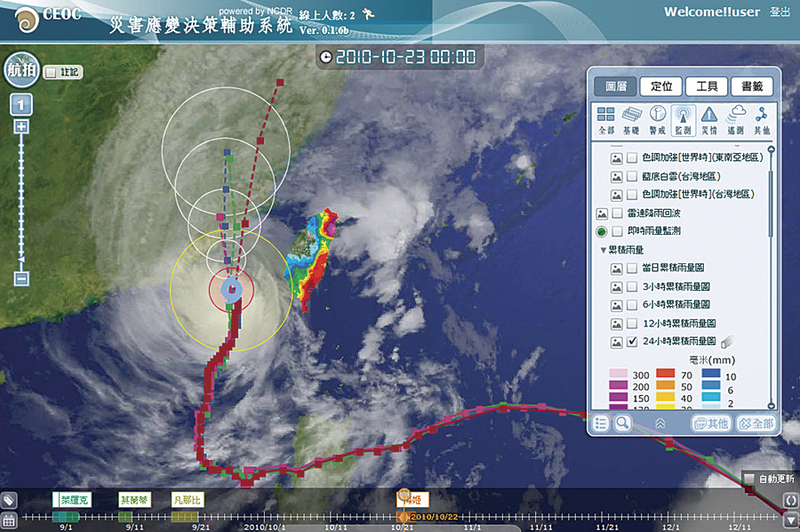 The basic toolbar features the four functionalities that are used most frequently during typhoons. The toolbar can float on the table of contents (TOC) and includes a map bookmark list, GIS tools, and a map position tool. 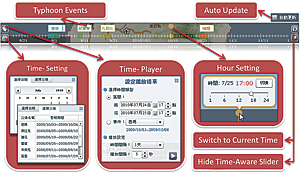 The advanced toolbar includes a time slider, dual-view mode, map event editing, and interface settings. Time-aware functionality displays the path of Typhoon Megi. During typhoons, disaster response commanders need to know all the different situations occurring at each point in time. In nonflood periods, disaster researchers need to analyze historical data regarding past typhoons. Therefore, CEOCDSS provides a custom time slider that allows users to view the data at any time; this data includes any type of attribute containing time, such as satellite imagery (visible and enhanced), water level, forecasted typhoon paths, real-time rainfall reports, radar data, and road disasters. In addition to the time slider, users can access the calendar list, which shows all historical typhoons and disasters and can be used for switching time periods faster. An auto-update time slider is also available. It is helpful for finding disaster information from older periods and monitoring current data in real time. 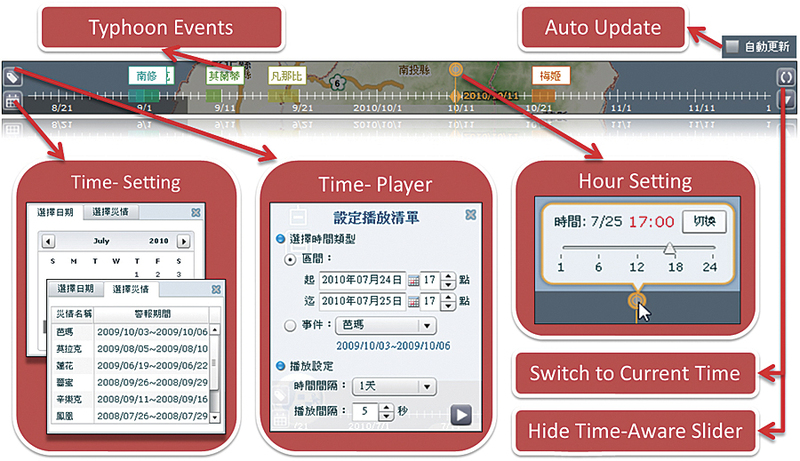 Users can also use the time player to display each moment of data between periods of time or during one typhoon. CEOCDSS embraces heterogeneous data that can be divided into dynamic map services, points in the database, tiled maps, customized advanced layers, and the nearest real-time picture from the operational point of view. Formats of and access and methods of connection to all the data are very different. For example, the base layer is published by an Esri map service using map documents (MXD); several types of real-time data are stored in the database; and real-time pictures, like radar images, are stored in folder directories in image format. Integration of multiple types of data in one GIS platform leads to restrictions about layer setting dispersal. System administrators must be aware of the data type and layer operation before applying settings. To solve these limitations, the NCDR-RiChi development team strengthened all parts of the system structure by inserting a data control mechanism between the data entities and system display. All information must be displayed using this mechanism, which includes layer labels, scale restrictions, default modules in CEOCDSS, data sources, and sorting in the TOC. All these items are centralized in the system database and can be set easily at the CEOCDSS management website. During typhoons, remote-sensing images can provide reliable information that rescue organizations can use to make decisions and immediately follow up on disaster response issues. CEOCDSS provides a satellite image dual-view mode, allowing users to compare two different images side by side. This functionality can be used for comparing different datasets for the same area or viewing data in different time periods. When users pan or zoom in or out on the map in one view, the other view moves simultaneously. With CEOCDSS, satellite images are published as the web map service and can be filtered and overlaid by a time slider. So far in 2011, CEOCDSS has integrated more than 100 datasets for NCDR with assistance from RiChi. In fact, CEOCDSS has actually been applied to six of Taiwan's typhoons, two exercises for disaster response, and two workshops about disaster intelligence; it also provides great performance in NCDR's decision support system. Decision makers can easily understand the different time period status of disasters via the time-aware functionality. For more information, contact Dr. Wenray Su, NCDR (e-mail: wrsu@ncdr.nat.gov.tw), or Chiajui Shang, RiChi Technology Inc. (e-mail: jerryshang@richitech.com.tw).